By contrast to drones used today, using one camera only, the Air Force has announced that it will be deploying in Afghanistan a new weapon of airborne surveillance: ‘Gorgon Stare’. This new aircraft has nine cameras, including thermal imaging, and will be able to transmit up to 65 different images to up to 9 different users. “With five electro-optical and four infrared cameras packed into each array, the system was designed to stitch a broad mosaic together, allowing several commanders on the ground to simultaneously grab slices of that bigger picture.” The live video stream will transmit enemy movements for analysts to study or for soldiers to tap into immediately with a portable device the size of an ipad to track ground movements. Soldiers will know how a mission is going or when the optimal time to start a campaign of engagement – live. Match the data with ‘boots on the ground’ in strategic places a new ground game is born “at the speed of war.” Since the city is under constant surveillance and being recorded, analysts can go back to study who planted the latest IED, or if there is a pattern along a particular road. 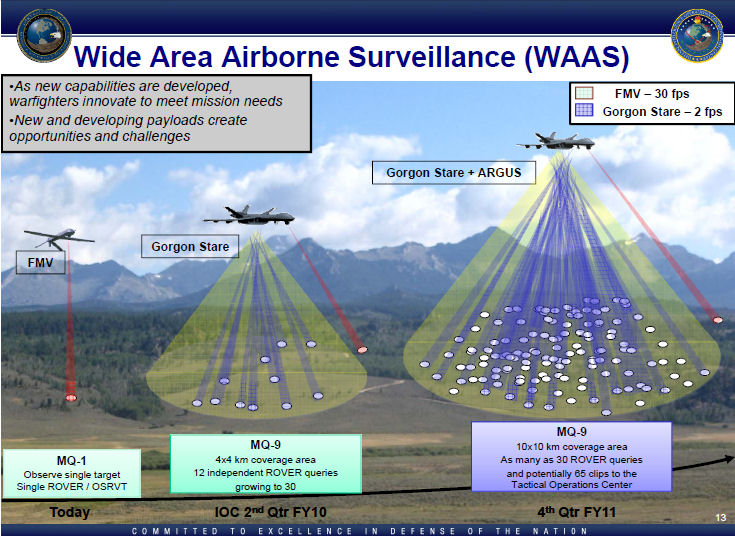 As a bonus, because this small aircraft will be looking at an entire city at once, there will be no way for the adversary to know what the target is. The Air Force is looking to mount wide-area surveillance cameras on airships that can stay aloft for up to two weeks. Each $17.5 million plane weighs 1,100 pounds, and because of its configuration will not be mounted with weapons. They also envision it having civilian applications, including securing borders and aiding in natural disasters.